Newton Aycliffe Rotary Club has been honoured with the highest possible accolade by one of the region’s most senior officials – North East England’s ‘Rotary Club of the Year’. In a comprehensive review of the club’s ‘exemplary’ service to the community, he cited its organisation of a model rail exhibition, partnership with Tesco’s fund-raising activities, support of District disabled games, charity golf day, involvement with local schools including distribution of dictionaries and its role in a four-club swimathon event which has raised over £300,000 since it began. There was praise, too, for the club’s PR officer and also for the current President, Rtn Nora Scott, and her sergeant-at-arms husband, David, who organise a ‘legendary’ weekly club raffle, as well as recognition of the club’s record of support for District by providing it with three Past District Governors and several District Officers. “I visited Newton Aycliffe many times in my year in office and the meetings were all vibrant and full of activity by a high proportion of the total club membership”, said the former District Governor. 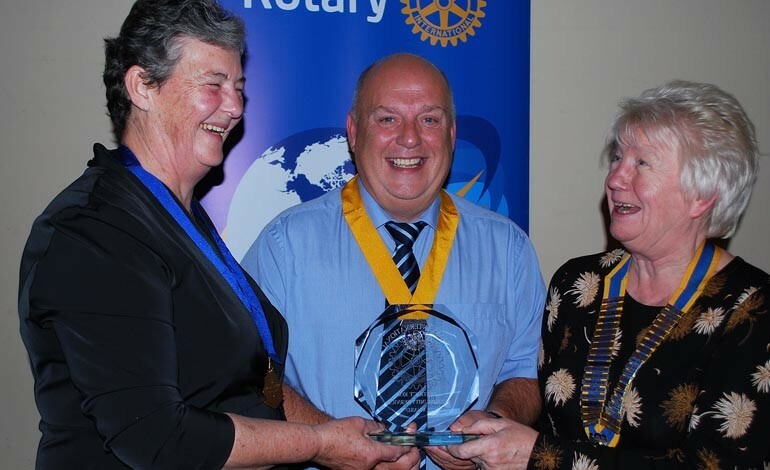 He presented the Community Service trophy to Newton Aycliffe’s Immediate Past President, Rtn Denese Cartwright (pictured left) with Immediate Past Community Service Chairman Tony Robinson and current President Nora Scott.